​Devarana Spa at Dusit Thani Manila invites spa lovers to experience the magic of the Eastern blend therapies through the new Borehilot Massage, available from July 2016 onwards. 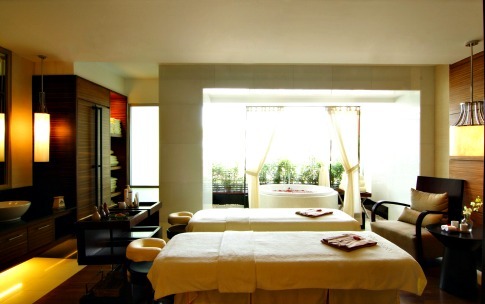 Borehilot Massage is the fusion of Filipino Hilot Massage and Balinese Boreh Remedy. In the traditional Eastern remedies, illness is believed to be caused by unbalanced energy within the body. When the energy pathways are blocked, sickness begins to take form in the body causing harm to your health. The core principle of Eastern therapy is to unblock and stimulate the energy meridians, aiming to maintain health and wellness - mentally, physically and emotionally. Devised to bring your body and mind back into natural balance in 90 minutes, the Borehilot Massage starts with the application of a warm Boreh paste which is the combination of ginger root, cinnamon, clove and rice powder. The terapist applies this warm paste on the specific area such as upper and lower back, legs and stomach to help warm up the muscles and improve flexibility. The heat and aromatic properties of the Boreh ease the strain and promote circulation. What’s more, warm banana leaves, soaking in warm therapeutic oil, are arranged to cover on top of the paste to let the heat penetrate deeper in that specific area, this ritual will be left there for a while to reduce the tension and relieve the back and legs pain. The massage therapy is completed with a long soothing stroke massage with medium pressure to stimulate the circulation. The benefits of this new massage are such as relieving fatigue, providing the energy and promoting luminous complexion.